Valve’s Dota 2 updates to Reborn will include the introduction of Dota Levels, release the new Treasury, enable the Tournaments area of the Watch section, roll out Reborn to all players and provide the Weather Effect items for all TI5 Compendium owners. The updates are expected to be completed by the next two days. The new patch update for Dota 2 prepares players for the launch of the Reborn client. Reborn, which has been in beta form since early June, will now be pre-loaded for all players and added to the main client in one or two days. In addition to the various adjustments and fixing of bugs within Reborn, the new Treasury will be released which will allow players to “quickly browse, explore, and purchase treasures”. The Tournament area will be activated for players to view matches and tournaments, and will include details and information for tournaments. Lastly, a new feature that is being added includes the introduction of the Dota Levels, a display of achieved accomplishments in Dota. TI5 Compendium owners will find the addition of the long awaited weather effects in their Reborn client, available for use. However, Valve issued a statement regarding the rewards for the still undelivered items such as the Axe Comic and Desert Terrain. Today you will receive the exclusive Harvest, Pestilence, and Sirocco Weather Effect items. We are still working on the Axe Comic/Immortal, as well as doing some tech work needed to support the Desert Terrain item. They will be granted to all Compendium owners as soon as they are ready. Valve has now introduced Dota Levels. The levels will be displayed as a badge on the player Dota Profile and are gained by earning trophies, participating in events, accomplishing various goals and playing matches. 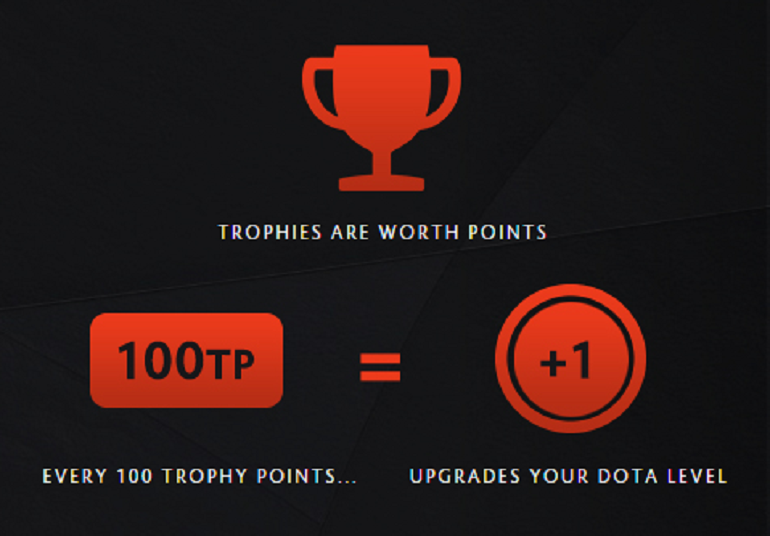 Each trophy contributes a different amount of Trophy Points toward your next Dota level. 100 Trophy Points = 1 Dota Level. Trophy Points are awarded whenever a trophy is earned, or is upgraded to a new tier. To see your trophy collection, including the point totals that each provides, select “Trophies” under your profile. All players will receive the first trophy “Experience Trophy” for simply just playing Dota 2. 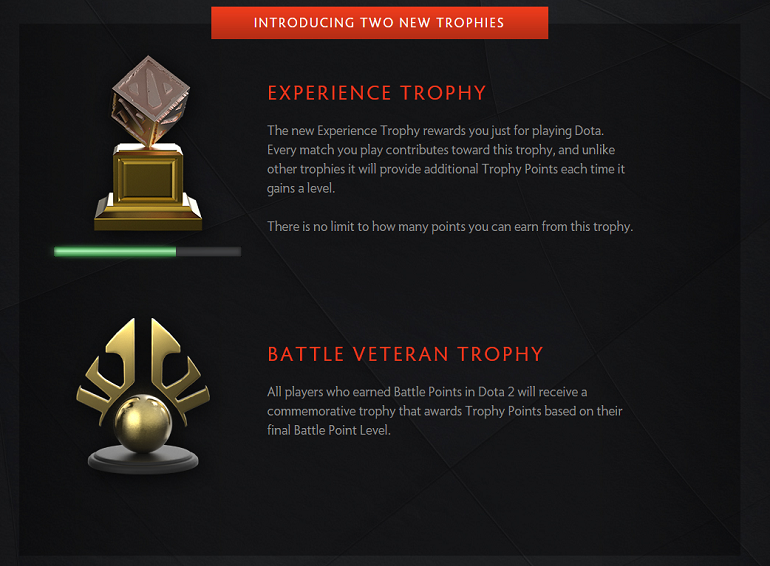 Most players will receive the “Battle Veteran Trophy” for earning Battle Points in Dota 2 previously. The weather effects were the reward for reaching Level 19 Stretch goal of $14,000,000 on the TI5 compendium, reached on June 18. The exclusive Harvest, Pestilence, and Sirocco Weather Effect items will be available to all compendium owners in the Reborn client.